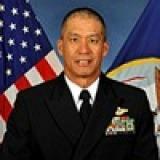 Rear Adm. Colin Chinn is currently assigned as command surgeon, U.S. Pacific Command, Camp H.M. Smith, Hawaii. A native of San Francisco, Chinn graduated from Johns Hopkins University in 1979 with a bachelor’s degree in public health and received a master’s degree in epidemiology from Johns Hopkins University School of Public Health in 1982. After his commissioning as an ensign in 1981, he attended the Medical College of Virginia through the Armed Forces Health Professions Scholarship Program and earned a Doctor of Medicine degree in 1985. He completed an Internal Medicine internship and residency at Naval Hospital Oakland, serving as chief medical resident in 1990. Chinn completed gastroenterology fellowship training at Naval Medical Center San Diego in 1993. Chinn has several tours with the Marine Corps. He was Battalion Surgeon with 3rd Reconnaissance Battalion, 3rd Marine Division from 1986 to 1987; Group Surgeon, 3rd Force Service Support Group, III Marine Expeditionary Force from 1998 to 2000, and Force Surgeon, U.S. Marine Corps Forces Pacific from 2008 to 2010. He was selected as the Navy Surgeon General Specialty Leader for Fleet Marine Forces during this tour. Chinn has staff physician tours at Naval Hospital Corpus Christi from 1990 to 1991 where he served as head, Internal Medicine and Laboratory medical director; and staff gastroenterologist and Independent Duty Corpsman Program director at Naval Medical Center San Diego from 1993 to 1998. From 2000 to 2003 he was the director of Medical Services, Naval Hospital Okinawa. He served as the executive officer, Naval Hospital Lemoore from 2003 to 2006 and completed a two year tour as the 15th commanding officer of Naval Hospital, Oak Harbor from June 2006 to June 2008. From July 2010 to February 2012, Chinn served as the director, TRICARE Region West/Pacific, overseeing Managed Care Support Contracts and an integrated health care delivery system in 31 countries and 21 states covering more the 3.1 million TRICARE eligible beneficiaries. He then served as director, Medical Resources, Plans and Policy division (N0931), Office of the Chief of Naval Operations from March 2012 to June 2013 and as the 10th Chief of the Navy Medical Corps from November 2011 to February 2014. He is a Fellow of the American College of Physicians, a member of Delta Omega (the National Public Health Honor Society) and an assistant professor in Medicine at the Uniformed Services University of Health Sciences (USUHS). He achieved board certification in Internal Medicine and Gastroenterology by the American Board of Internal Medicine. Chinn is a Fleet Marine Force qualified officer. His personal decorations include the Defense Superior Service Medal, Legion of Merit with Gold Star, Meritorious Service Medal with two Gold Stars, Navy and Marine Corps Commendation Medal with two Gold Stars, Navy and Marine Corps Achievement Medal and various unit and service awards.